I get it. I get why health-conscious Americans sometimes serve fake food at home. I get it, because I did it. I confess: I served frozen generic toaster waffles to our two young grandchildren for breakfast last weekend slathered, ironically, with trans-fat free yogurt-based spread and USDA-certified organic maple agave syrup blend. An industrial-manufactured fake food of the first order doused in pretentious products of smug Whole Foods purists. Frozen waffles doused and drenched but not disguised. Our seven-year-old pronounced them "Awesome. Really awesome!" My excuse? I was in a hurry at the market, and besides, I knew the kids couldn't wait the time it takes to properly mix and make waffles from scratch. They have fun things to do, favorite places to go, and they'd be hungry. At the market, I hid the frozen waffle box, fearing disapproval of fellow shoppers. What if I ran into friends or neighbors? What would they think? That I feed fake industrial-made foods to my family? That I secretly binge on fake foods? They know I blog to expose the worst of modern industrial fake foods. Will they brand me a health hypocrite? Embarrassed, I slid the bright gold box under a sheath of red-leaf romaine lettuce, heirloom tomatoes, organic apricot-plum hybrids, and a loaf of cracked wheat sunflower-seed dill bread in an artisan-baker bag made of crinkly recycled paper. I made it home, my food crime undetected. But I could have done better by them. I could have bought quality ingredients... fresh eggs, organic milk, unbleached flour... and invested time to make hearty waffles worthy of my grandmother's tradition. 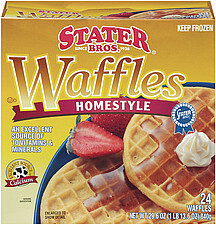 I could have pre-made and frozen waffles to pop in the toaster for quicker serving to busy children. 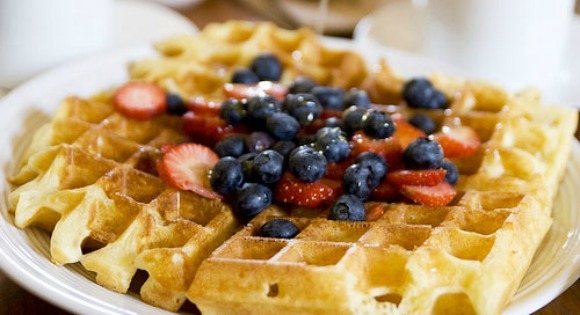 I could have served the waffles with fresh fruit, not syrup. But I didn't. Oh, a second confession: I, too, munched on generic frozen toaster waffles. Our seven-year-old was right. They tasted awesome. When we get a case of sweet-tooth (after all, it's really all about the sweetness, isn't it?) it's really quick and easy to stir up some pancakes. Flour, egg, oil, buttermilk, dash of salt, a bit of sugar and some vanilla -- voila! I like to make the batter thin, making little "silver dollar pancakes." Of course they can't go in the toaster, but left-overs come alive in the microwave.